Have you been watching the markets lately? If you are getting into investing then you should be keeping up with how the stock market is doing each day or at least week to week. For those of us that are buy and hold investors, checking in on the market’s performance on a month to month basis is usually good enough. However, you should be informed of big economic movements like what is happening in Europe right now with Greece and the PIGS. But the markets are not always doom and gloom. There are some events that happen on a year to year basis that could benefit you. The Santa Claus Rally is one of those events that is expected to happen year to year. It is called the Santa Claus Rally because it occurs right around Christmastime and goes through the end of the year. Each December the markets are usually uplifted and show positive performance. If you’re a superstitious person, then you might believe it’s because Santa Claus is really bringing a gift of cash to your portfolio but there are a few reasons I believe it happens and they are a bit more rational. Mutual fund managers work hard to generate a steady return each year based on their chosen style. If they are a large cap manager they will only invest in stocks with a large market capitalization. Mutual funds are regulated and part of that regulation involves a restriction on short selling. Before the end of the year, a mutual fund manager may have a portion of cash on the books. Some of that comes from the constant percentage of cash that they decide to have on hand but there is usually a higher amount of cash on hand from stocks that pay capital gains at the end of the year. The mutual fund will payout or reinvest. With a higher chance that they will reinvest, mutual funds are buying into the market and thus the overall price goes up. Hedge funds are a little bit different from mutual funds in that they are allowed to short sell as well as go long. Hedge funds are usually highly leveraged; for example, for each dollar of cash they may have 10 dollars invested. They use margin and other methods of borrowing to generate outsized returns for their investors. Before the end of the year, many hedge funds are looking to close short positions and invest excess cash similar to mutual funds. All of this closing short positions increases normal buying activity. This coupled with buying to get excess cash off the books pushes the markets higher. The last practical reason that I see the markets rallying into the new year has to do with tax benefits. If you experienced a loss in one stock or several and you don’t plan on keeping that stock in your portfolio long term, you may consider selling it to take advantage of the ability to claim the losses on your next year’s tax return. However, if you are smart, you won’t just take the cash and run, but you will invest the cash back into the markets. Some investors are also buying stock as a gift for relatives before the end of the year to take advantage of tax benefits from gifting. The tax code rules and benefits have a heavy impact on end of year selling and buying and play a part in the Santa Claus Rally. The Santa Claus Rally normally extends from after the American Thanksgiving holiday into the New Year. This year provided a really nice opportunity to buy into the dip in November and get ready for the rally. 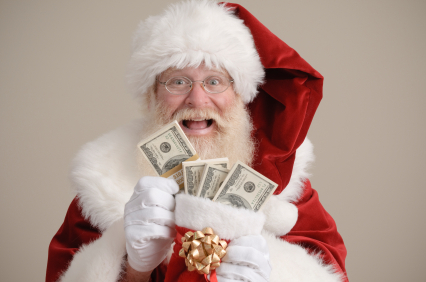 Did you position your portfolio for the Christmas gift from Santa Claus? Disclaimer: Although this rally is well known in the investment industry, it is not always guaranteed and you should always consult your financial advisor before beginning any investing strategy to determine the suitability of the strategy. Given that everyone took a hit in 2011, I’d be surprised if investors get to break-even with this year’s Santa Claus rally. It’s a different story if it continues into early 2012! I have been pretty disappointed with this year’s rally. Not much to get excited about. Have you heard of sell in May, go away? That’s another market phenomenon that is usually dead on. June, July and August are usually the worst months for gains. I honestly didn’t expect to see a Santa Claus rally this year. Of course, there is still some time before the end of the year, but this week has been strong. I didn’t really change anything at all in my investments. I bought into it around November but I had been planning to do so anyway. It’s usually just a nice boost for me. Like @YFS, I just follow my long-term strategy. It’s very boring, but that’s part of the charm. I don’t like drama from my investments. That is very smart. I’ve been an emotional trader before and I have to say that it is the most dangerous thing to do with your money. I am a long term investor, so I do not think about these things. It is nice to see though. I am the same way in my retirement accounts but as I build them, I remember these market moves as a good time to buy and try to determine the best time to sell. It looks like we are currently in Santa clause rally. The market just started to rally this past week. will it continue next week and into first week of January? That’s the hope. It seems like this year started late, I think because of the payroll tax act. But for the most part it’s done ok.
We almost missed the rally, but then the unexpected did happen and S&P’s in the black for this year! I’ve heard so many investors say this year was pretty much a wash! lol Let’s hope for some good movement up in 2012. I’m sorry to say, due to all those that did not do well, but I did great this year investing in the markets. Perhaps it’s because I take a different approach than most… I’m more active and avoid taxes due to the type of accounts I use to trade. For the others, I use a weekly approach which often results in far less trades and more long-term results. Either way, the money was there to be made this year if you didn’t simply buy and hold. It’s amazing what can happen with everyone doing something collectively! Nice breakdown on what causes a Santa Claus rally. 2011 was pretty tough. Almost like the lost decade compacted in one year. Selling in May and going away would have been nice to use this year, but it’s hard to pick and choose like that. The rally does seem to be picking up. Hope it carries into the new year!